The exclusive figures from Man-E-Toys.com were first featured in the August 26th Epilogue. As stated in that Epilogue an order was placed. 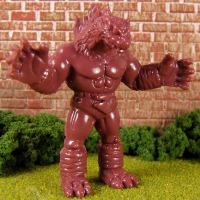 Because all of the other Eric Nilla & Nama-Niku.com figures were already owned in other colors the Manzilla 2 was ordered. The difference between Manzilla #1 and #2 never really registered. 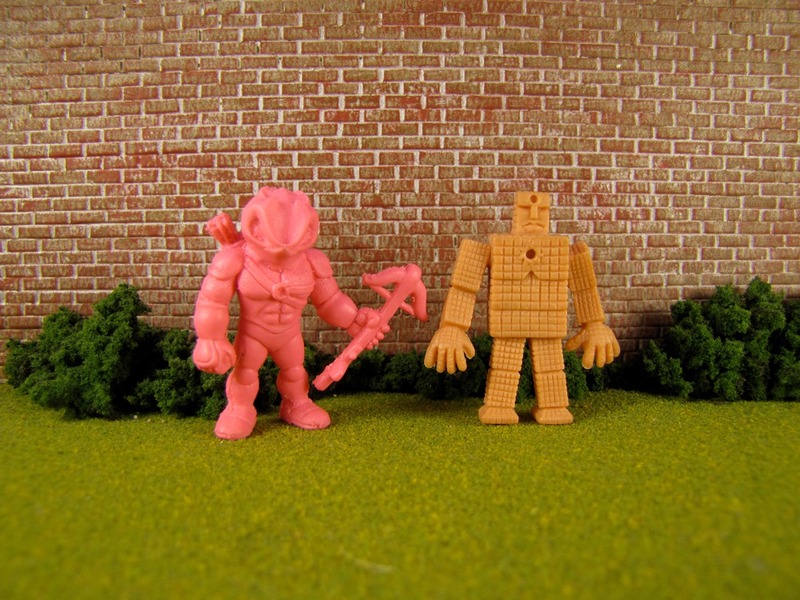 Manzilla 1 had been hailed as possibly the best custom M.U.S.C.L.E. figure ever, but that honor should really go to Manzilla 2. The difference in arm positioning makes all the difference. There was a lumbering quality that the downward arms gave Manzilla 1, but the outstretched arms of Manzilla 2 give the figure the battle ready positioning this figure deserves. Manzilla 2 also features a beautiful header card. It’s simply, it’s clean, and it features all of the pertinent information. It is easy to dismiss header cards as a less than critical element of a custom figure. However, an attractive header card does so much to create a positive first impression of the figure. And conversely unattractive header cards create such a negative first impression. Thankfully Manzilla 2 is the former – but its overall quality would have allowed it to be packaged in anything. Manzilla 2 is so amazing that trying to describe it would sound insincere. It would sound like cheesy salesman hyperbole. Just look at the pictures and understand that they will never do the figure its full justice. 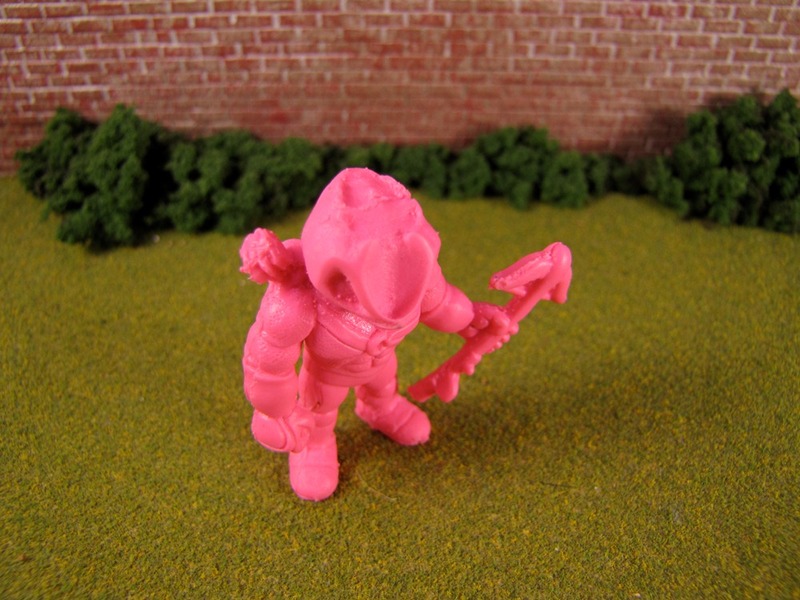 Every M.U.S.C.L.E. collector should own this figure. Period. And owning it in either the Blue or Purple exclusive Man-E-Toys.com colors is a great choice. 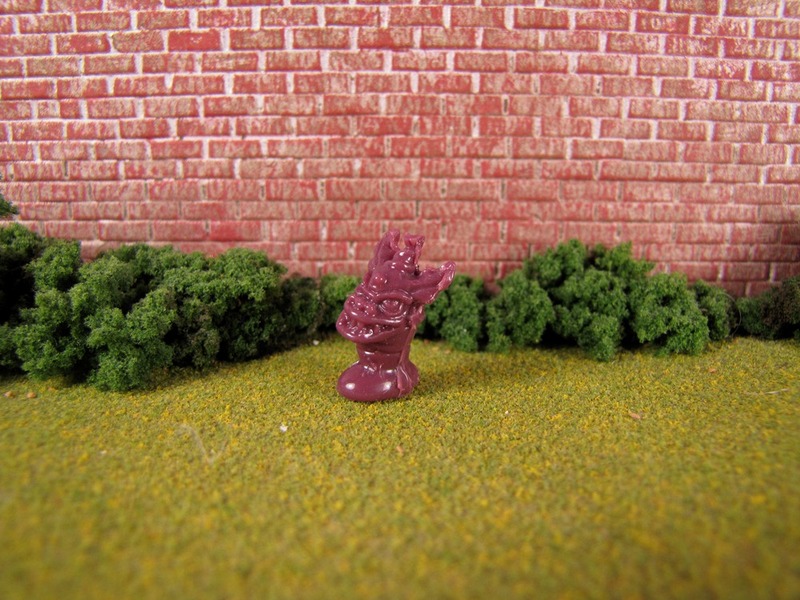 The figure received was the scarcer Purple version. It is a wonderfully unique and attractive color choice; a choice that is going to make this figure really stand out on many collectors’ shelves. 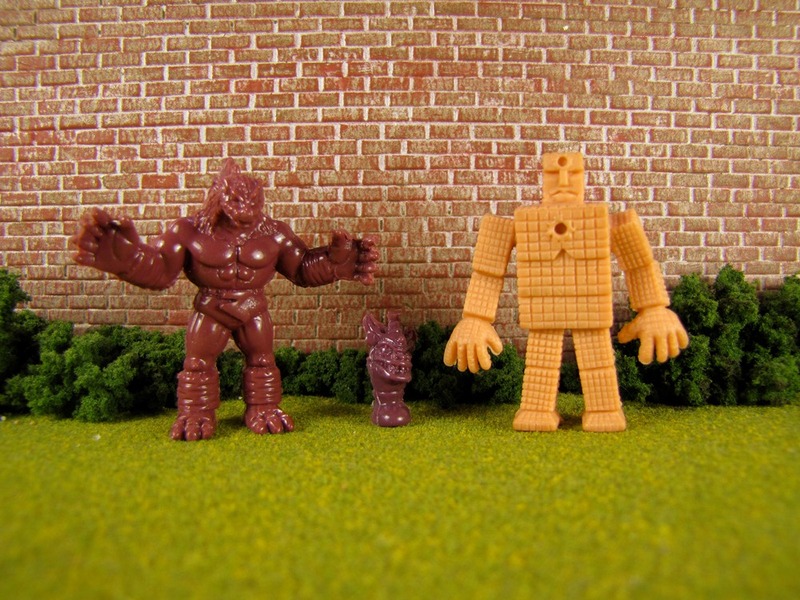 The Manzilla 2 also comes with a very odd companion. 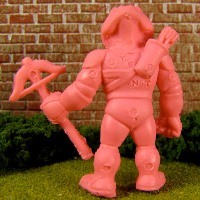 It is the head of the #177 M.U.S.C.L.E. figure connected to a foot. From a craftsmanship perspective the figure is incredibly well done. However, it is very tiny and very unusual. This may cause collectors to have an instantaneous love or hate relationship with the figure. Regardless of the relationship, no collector will object to getting extra components with their figures. Cost can be a big part of custom figures for many collectors. The Manzilla 2 is sold in the Man-E-Toys.com Webstore for $16 plus shipping. Given the quality of the Manzilla 2 figure this is an absolute steal. 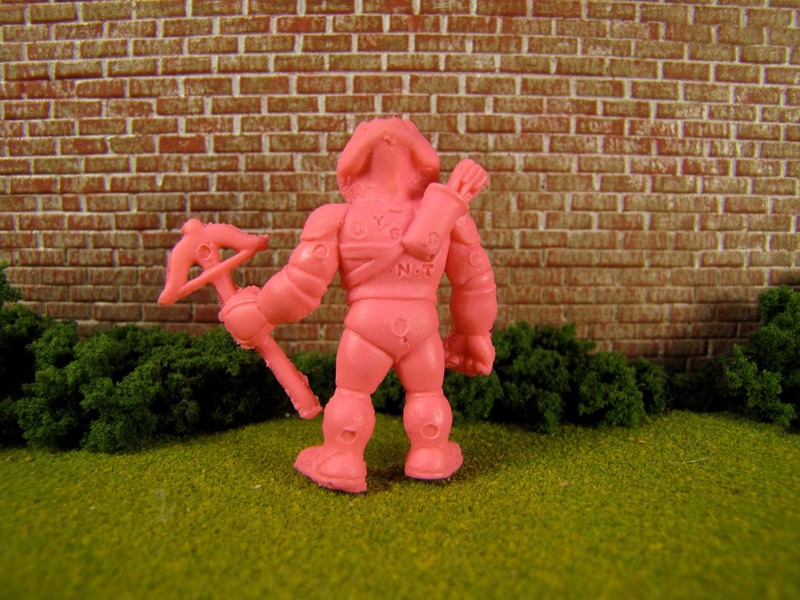 Any M.U.S.C.L.E. collector that does not add Manzilla 2 to their collection is simply missing out and making a terrible, terrible mistake. Man-E-Toys.com was also gracious enough to include an extra figure with the Manzilla 2 order. 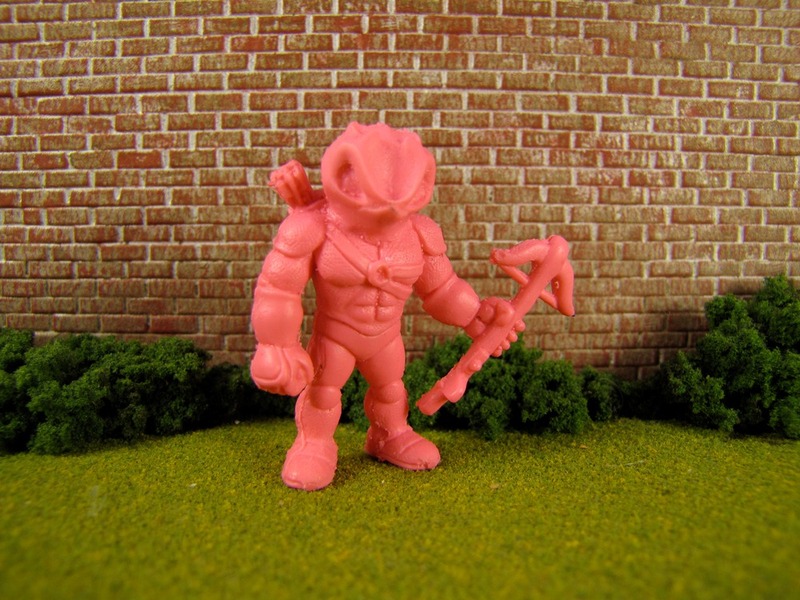 The figure is a pink Skworm Hunter. 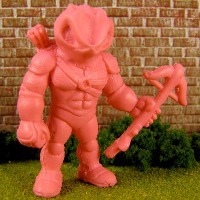 This figure is part of the upcoming Skorm Universe of figures from Man-E-Toys.com. In fact, the Skorm Hunter may even venture into the Gloys universe with compatible pieces. When the figure was originally revealed it seemed like a pretty simple and straightforward head swap. Nothing about the figure was particularly charismatic. That impression was completely incorrect. It was a reminder that figures need to be physically held before judgment can be fully passed. The Skworm Hunter head deserves closer attention and it is a bit difficult to fully appreciate through a few pictures. 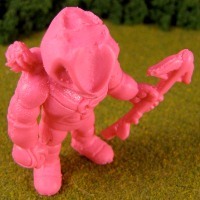 The Skworm Hunter head adds so much to the body of the #143 M.U.S.C.L.E. figure. The new head transforms the figure into a much darker character – a fierce and formidable hunter. Because this figure was given as a gift and is not currently available in the Man-E-Toys.com Webstore it is difficult to comment on the value. Man-E-Toys currently has another 2-pack on sale for $22. If Skworm Hunter comes to market in a 2-pack blister pack, then it is rather safe to assume it will be slightly more expensive than $22. 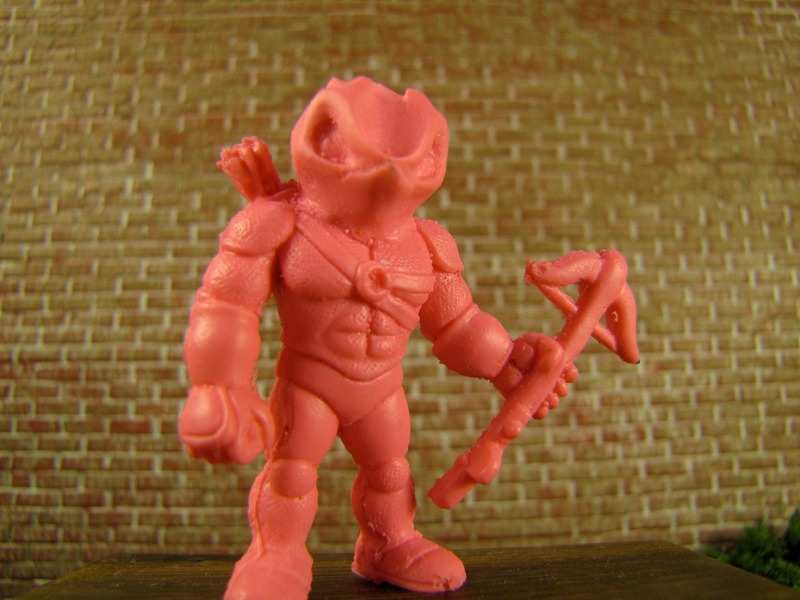 Hopefully this will not deter any collectors, because Skworm Hunter is a figure that should not be overlooked. 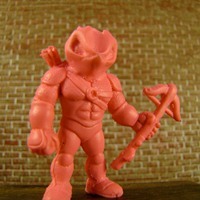 It should also be noted that collectors would not get the exact Skorm Hunter as the original mold was damaged. Thankfully a new, and even better, mold has been created. And be sure to keep an eye on Man-E-Toys figure releases! The Skorm universe and the H.U.S.T.L.E. brand are poised to do some very exciting things with both resin and rubber mini-figures. This entry was posted on Tuesday, September 25th, 2012 and is filed under Art, UofM News. You can follow any responses to this entry through RSS 2.0. You can skip to the end and leave a response. Pinging is currently not allowed.